India lies between the latitudes 8°4′ N to 37°6′ N. It lies between and 68°7′ E to 97°25′ E .
With an area of 32,87,263 sq km India is the 7th largest country of the world After Russia, Canada, USA, China, Brazil, and Australia. India has 15106.7 Km of land border running through 92 districts in 17 States and a coastline of 7516.6 Km [6100 km of mainland coastline + coastline of 1197 Indian islands] touching 13 States and Union Territories (UTs). Indian Standard Meridian 82° 30’E Meridian crossing through the Mirzapur city of Uttar Pradesh is taken as India’s Standard Meridian. Indian Standard Time is ahead of Greenwich (00 or Prime Meridian) Mean Time by 5 hours and 30 minutes. The Tropic of Cancer passes through the middle of the country dividing it into two latitudinal halves. 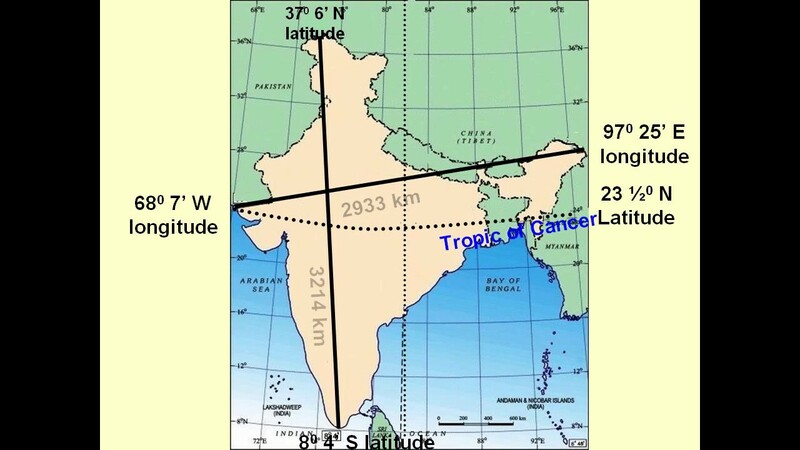 Tropic of cancer (23°30’N) passes through Gujarat, Madhya Pradesh, Chhattisgarh, Jharkhand, West Bengal, Tripura, and Mizoram. The effective border between India and China is known as the McMahon line. The line that separates Indian-held lands from Chinese-held lands is called the Line of Actual Control (LAC). Duncan Passage is a strait in the Indian Ocean. It is about 48 km (30 mi) wide; it separates Rutland Island (part of Great Andaman) to the north, and Little Andaman to the south. West of Duncan Passage is the Bay of Bengal; east is the Andaman Sea. The Nine Degree Channel is a channel in the Indian Ocean between the Laccadive Islands of Kalpeni and Suheli Par, and Maliku Atoll. These two subgroups of islands, together with the Amindivi Subgroup, form the Indian Union Territory (UT) of Lakshadweep.The Channel is approximately 200 km wide with a depth of 2597 metres. The Ten Degree Channel is a channel that separates the Andaman Islands and Nicobar Islands from each other in the Bay of Bengal. The two sets of islands together form the Indian Union Territory (UT) of Andaman and Nicobar Islands. This channel is 150 km wide from north to south, and approximately 10 km long from east to west. The Northernmost point of the country is the Indira Col is situated in the west from 3 km of Sia Kangri, the summit has the boundary of India, Pakistan, and China. The southernmost point of the country is the Pygmalion Point or Indira Point is located at 6° 45′ N latitude.